First of all, happy Easter weekend everybody. If you don't happen to celebrate Easter, then happy excuse to have a long weekend (everyone is a winner!) Regardless, it is a long weekend as I stated, and I think it is safe to assume that a long weekend is synonymous with "too much food", and "too much family". I am joking, of course...You can never have too much food. The following recipe was actually just concocted on the spot this morning, but it was absolutely delicious, fresh, and a great breakfast choice when you feel like something a little special. Read on! So, essentially this recipe involves two parts, making the pancakes and making the brown sugar glazed apple and walnut topping. As when I wrote my turkey bechamel crepe recipe and did not elaborate on how I made the crepes, I will not include the recipe I used for the pancakes as such a recipe is really redundant to include considering the overflow of them on Google. Use your favorite pancake recipe, pancakes from a box, or try something new you found on the web. Personally, I recommend oatmeal pancakes for this recipe as they are low in gluten and sugar (the brown sugar will make up for this), but you can obviously choose what you want. I warn you again however, don't use pancakes that are too sweet! Now, for the good part. Use apples of your choice for this as well, with a ratio of about one apple per person unless you feel unusually hungry that particular morning. I recommend using some red apples of some sort, but also using a granny smith apple as one of the apples to incorporate some tartness to the otherwise overly sweet apple mixture. Gather the apples, chop them into smallish chunks, and gather a handful of walnuts and chop them finely. Then, in a large pot or wok, melt a decently large chunk of butter. What you are aiming for is for every apple piece to be covered in a thin sheen of butter. If you have lots of apples this could be tricky, but you can always add butter in later if the mixture looks too dry. Just don't go Paula Deen style as that would probably age your arteries by five years or so. Do this on low heat! When the butter is melted, add the apples and walnuts to the pot and begin stirring immediately. After a minute or so, add as much brown sugar as you feel is necessary. We had three apples, and used more than two tablespoons of brown sugar. It was slightly too sweet, but you really can't mess this up and there is a trick at the end of the recipe if you do! Again, have fun with cooking! Experiment, and cook by tasting instead of following a recipe blindly. 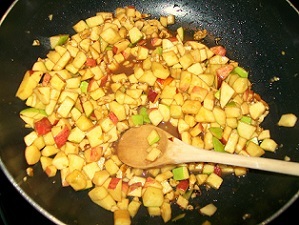 Continue to mix the apples and walnuts, ensuring the syrup that will form does not harden on the bottom of the pan. Add some cinnamon if you desire, and keep mixing! Do this until the apples have soaked in some syrup, and become soft with only a little crunch. If you have a different preference, then by all means cook the apples to whatever you want them to taste like. Congratulations, you have successfully read through the jumble of instructions above and have hopefully cooked something tasty (if not, I apologize. I have not written a recipe in a while and this one isn't very detailed.) One last part however, and that is to serve with a dollop of sour cream on the side of each pancake topped with apples and walnuts. The contrast between sweet and sour is so amazing in this recipe with the addition of sour cream, and it really makes the recipe stellar. Hope you enjoy the recipe if you stumbled across this blog and decide to try it! Please consider sharing it with friends, or following for more recipes and an assortment of other things. Thanks again!